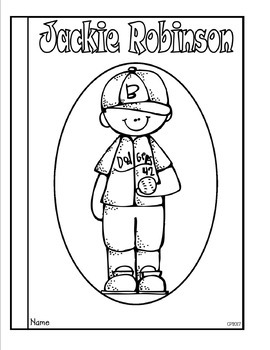 This nonfiction booklet is great to use when teaching American Heroes such as Jackie Robinson on the elementary level. 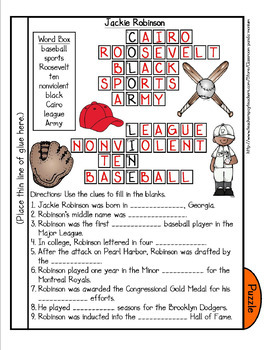 This is perfect to use during Robinson's birthday in January, Black History Month in February, while studying the novel Jackie Robinson and the Year of the Boar, or during Jackie Robinson Day in April. 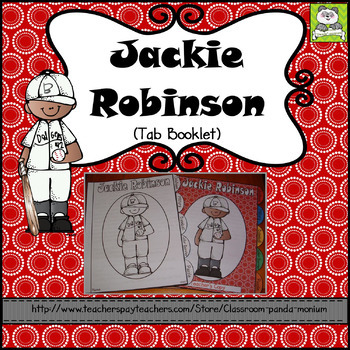 It meets Georgia's second grade Social Studies standards SS2H1: The student will read about and describe the life of historical figures in American history-Jackie Robinson. Click Here to Save 20%. This informational reader contains 6 pages including the cover. A teacher booklet is provided in color with answers in red. This tab booklet uses rounded tabs which are easy to cut for young learners and makes finding the page even easier. Students that have difficulty cutting can just cut out the rectangle without the tab. Vocabulary and font size are perfect for early elementary children in grades second and third. 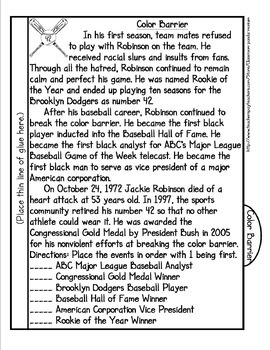 Need more resources on Jackie Robinson. Click the link below for the bundle to save you money. For other American Heroes Bundles, click on the links below. Click below for just the tab booklets. Thank you for stopping by my store: Classroom "Panda"-monium. Informational Tab Booklets are great to use to supplement novel studies, perfect for enrichment, and easy to use for those early finishers. Just place Xeroxed copies in a folder labeled with the topic. Place folders in a crate somewhere in the room. As students finish work, they may select a booklet to work on. Once they finish the booklet, turn into teacher to be graded. Or laminate the teacher key, and have students grade on their own. Imagine all the new facts your students will pick up in one year from these nonfiction tab booklets.